← The “Big 5” – and students saw them all! People view long journeys from different perspectives. Me – I tend to take a leg at a time (“let’s drive 2 hours to lunch and not think about the travel big picture”). Others like to calculate the total time traveling and then painfully countdown (on an app these days) how long it will take to get home to loved ones. I would have rather not known, but our trek will take about 43 hours, door to door. We began our journey home leaving Para Lodge in Murchison Falls National Park in Northern Uganda at 8 AM with our trusted guide Arthur. The trip out of the park was a small safari and we saw more giraffes, antelopes, wart hogs and some elephants (from afar). After that, we drove 440 km (about 273 miles). Most of it was decent highways so we made good time (after that lunch I was talking about). To get to Entebbe International Airport we need to go through Kampala. As noted on previous blogs the traffic “jam” can be pretty bad and so Arthur made sure to leave plenty of time. Since we lucked out with the jam, we got to Entebbe at about 5 pm which too early for an 11:30 pm flight. Arthur suggested we have dinner and hang out at a local restaurant for a few hours. Arthur suggested we eat at Faze 3 which was a great suggestion since it was inexpensive and overlooked Lake Victoria. After getting through check-in and customs we are sitting awaiting our flight. 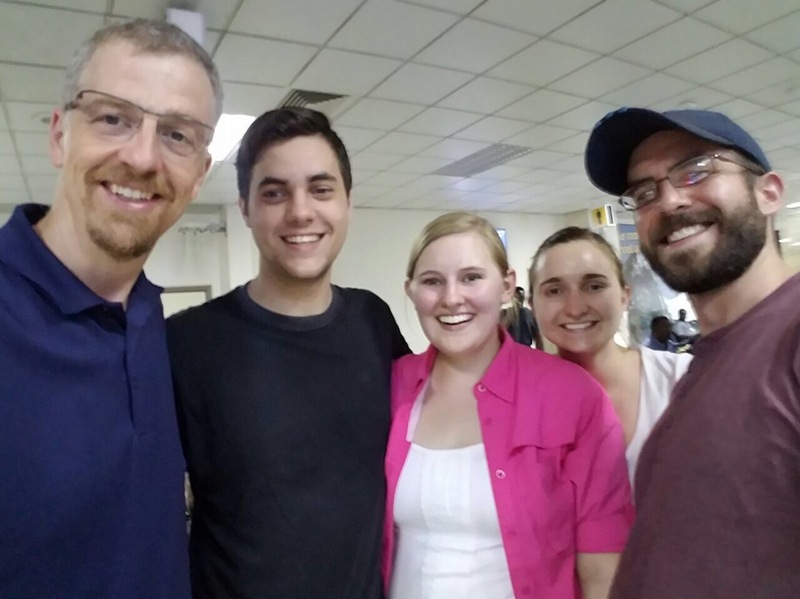 This is my last blog for the trip – the students and “Professor KarenBeth” (as everyone here calls her) will wrap up. This has been an awesome professional and personal experience. I have learned so much over the past few weeks about Uganda – from its culture, to its healthcare and stunning environmental beauty. 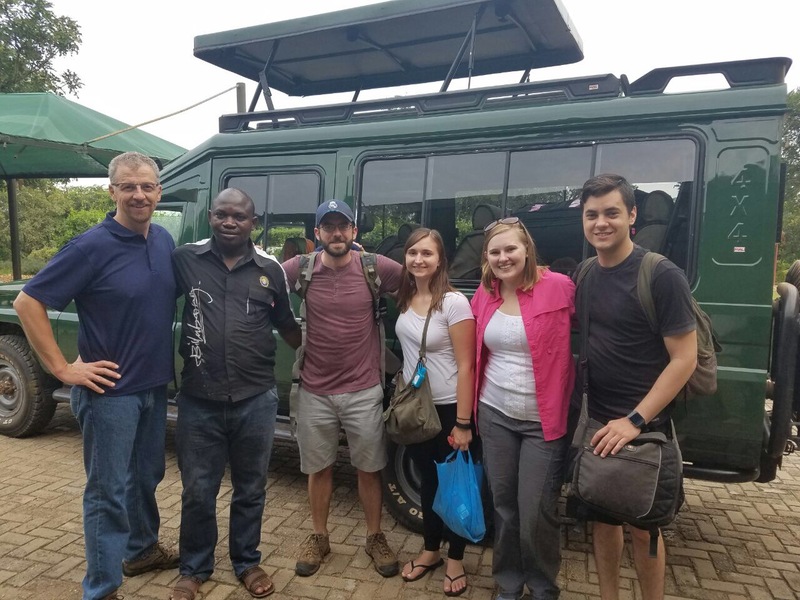 It was a pleasure to work with the pharmacy students from Uganda but, I must say, they are no match for the four outstanding young student pharmacists from Wilkes that I had the pleasure of travelling with. Finally, big Kudos to Dr. KarenBeth on this program. It is hard to believe this was her 10th trip to Uganda. She should be very proud of her accomplishments here. This entry was posted in Diseases/Health, My Safari (My Journey/Adventure), Ugandan Nature and tagged Binghamton University, binghamton university school of pharmacy and pharmaceutical sciences, Global Health, Global Pharmacy, Global Pharmacy Education, Global Pharmacy Practice, international pharmacy, Kampala, Makerere University Department of Pharmacy, murchison falls national park, pharmaceutical care, Pharmacy Students, Uganda, Ugandan Pharmacists, Ugandan Pharmacy Students, Wilkes University, Wilkes University School of Pharmacy. Bookmark the permalink. Hard to believe it’s over already. Thanks for taking us along. Enjoyed following your adventure, professionally and culturally ! Safe traveling!